Sea Fish Species around the Welsh coast. Bass: This strong predatory fish is the most popular species that is targeted around the coast of Wales. Can be caught in most areas on a variety of methods from May to October. Boats operating out of the majority of Welsh ports will go after bass. Plaice: Can be caught over shallow clean sandy areas, often feeding on worms and Mussel. Dabs: Often caught when fishing for other species, tends to feed on worms and small crustaceans found near sandy areas. Tope: An obvious member of the shark family that is fished for mainly during the Summer months. A scavenging fish which feeds on smaller sick, injured or dead fish. Always use a wire trace when targeting this species. Cardigan Bay is a particularly good place to go after this powerful fish with boats operating from Aberystwyth and Aberdyfi often being booked up months in advance. Pouting: often considered a bait robbing pest by Cod and Whiting Anglers it can grow to a couple of pounds. A characteristic rat-tat-tat bite often experienced by anglers fishing afloat all around the coast but mainly the south and North coast. Conger: A feared and respected species that is mainly taken near snags and obstructions such as wrecks. Sizes vary from 4 – 5 lb right up to 120 lb monsters that can be encountered in deep water. A wire trace is necessary to prevent the sharp teeth of the conger from tearing through your line. Whole fish or squid mounted as baits are the order of the day. Weever Fish: One species that can pose danger to the visiting and resident angler alike. Often caught during the summer this brown and white spiky character hides poisonous spines in its dorsal fins and gill covers. Extreme caution is needed when handling this fish and any handing avoided if at all possible. Seek medical attention immediately if you think you may have been stung by the Weever. Pollack: Another hard fighting species that will entertain the holiday angler who visits Wales. Mackerel feathers, sandeels, pirks and jelly worms and fresh worms are all good baits for this tough fish which hunts near wrecks and other underwater obstructions. A tasty fish when eaten fresh, will often grow to 10lb but are usually caught around the 4lb mark. Mackerel: Getting afloat on a summers evening can ensure that the barbecue is well stocked. Mackerel are abundant around the coast and finding a shoal is easy if you have a boat. The easy way to catch them is on feathers and hokkai rigs and don’t be surprised to catch one on each hook. Black Bream: A summer visitor which is particularly common in Cardigan bay. Baited feathers are usually the method used to catch this fine eating fish. Can grow up to 4 lb. 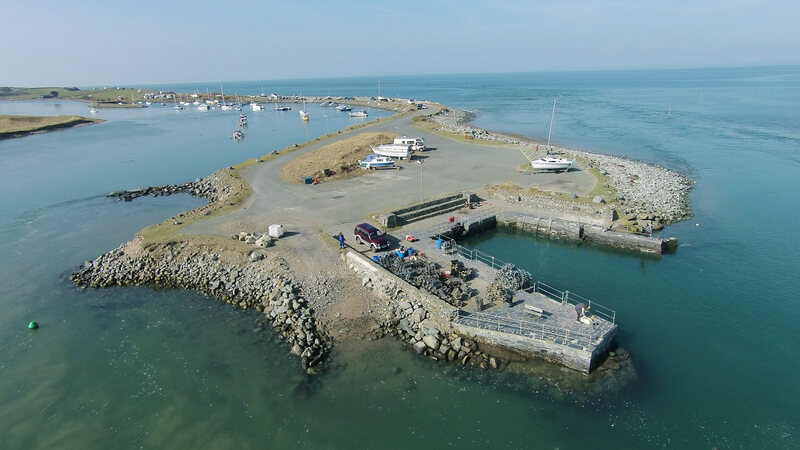 Boats operating out of Pwllheli often target Bream. Thornback Ray: Fairly common in deeper water over sandy ground where they will take fish baits, crab and worm. Cardigan Bay and Camarthen bay are particularly good areas.